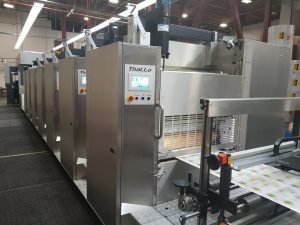 After seven installations outside the USA, Lithotype Company, America’s trusted supplier for high-barrier printed roll stock and stand-up pouches, announced that it has successfully commissioned the first Contiweb Thallo press in North America. The new press is also equipped with environmentally friendly electron beam curing technology which greatly reduces the consumption of natural gas and VOCs used in the production process. EB inks are 100% solid which reduce VOCs to nearly zero. With packaging producers under intensifying pressure to cut costs, reduce turn-around times and achieve higher print quality, web offset is often a better alternative to the flexo and rotogravure process currently used by many packaging converters. The Contiweb Thallo web offset system is a robust and economic solutions for shorter run lengths, giving packaging manufacturers high flexibility and increased productivity, while maintaining excellent print quality. You can find more information on the Contiweb Thallo here. Contiweb Thallo web offset systems are produced and distributed under a strategic partnership between Contiweb and DG press. Contiweb will be exhibiting at Labelexpo Americas from 25-27 September 2018. The event is targeted at labels and package printers. Labelexpo Americas takes place at the Donald E. Stephens Convention Center in Rosemont, Illinois, a suburb of Chicago. Come and visit us at booth 6464.